We swim by slipping our body through the water. Reducing frontal area and drag are important to faster swimming. 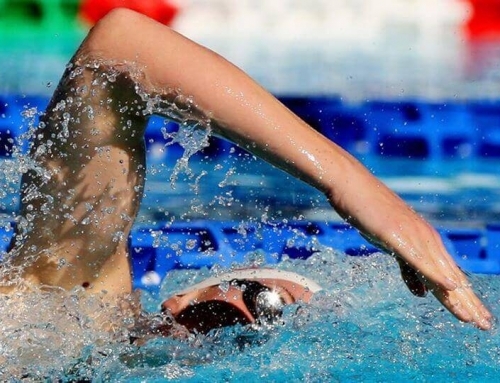 A horizontal body position, with your body moving smoothly across the top of the water, is effectively swimming through a relatively tire tube. The tube is the same diameter from your head to your feet. If you have poor horizontal body position, if you drag your hips, legs, and feet, the diameter of this body tube becomes much bigger and creates more drag. This requirement for horizontal body position is absolutely fundamental to effective swimming and is a “Do-Not-Pass-Go” issue. We have several balancing tools to help us achieve a horizontal body position: arms, head, lungs and an effective kick. Everything happens around the fulcrum of your lungs. Imagine your body is a teeter-totter, with your lungs as the fulcrum or balancing point. The more “stuff” you can put in the front of your lungs the more you’re able to counterbalance your heavy legs. So rather than trying to kick or force your legs up to the surface, use buoyancy and leverage to simply float them to the surface. This is the free speed with virtually little cost. 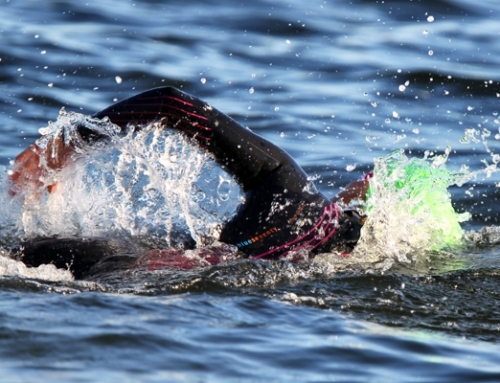 If you are swimming, with little body rotation, you’re presenting lots of frontal area to the water. You’re also pulling with the small muscles of the shoulders and delts. Not only are these muscles small and weak, but they’re also not made to pull. They are designed to stabilize the shoulder. By relying upon these muscles to pull and provide power to your stroke you are increasing your risk of injury. If we didn’t have to breathe, swimming would be easy. But you are a new, inexperienced swimmer and you’re a little freaked out about it. You want to get to that breath as soon as possible. The air is up and the water is down. You instinctively want to lift your head up to the air to breath. Remember the air is the same all around. When you lift your head up, you push the water down. This is exactly what you DO NOT want to do. When you rush the breath you’ve started your pull early. You’ve now taken your arms, your very effective balancing tools, out of your front quadrant and moved them closer to the lungs, your fulcrum. Your legs begin to drop. At the same time, you’ve lifted your head up toward the air. Anything above the water pushes something else down. This forces your legs to drop more, increasing drag. As an inexperienced swimmer, you MUST realize that your method of breathing (i.e. push down and lift your head so you can get to air NOW) is completely counter to what you should be doing and is the source of your problems. Breathe with one goggle out of the water and with zero head lift. (look for the fishes) Imagine there is a spike driven through the top of your head to your spine. Your head simply rotates along the axis of that spike; it does not lift. Triathletes with a running back round typically have very tight ankles, making it difficult for them to point their toes and keep their feet inside the tube. If you have tight ankles, try sitting on your feet while you watch TV, gently stretching your ankles. Notice that we haven’t once spoken about what you probably thought was the key to faster swimming: grabbing more water with a stronger pull. For you, the adult swimmer/triathlete, swimming is 70 percent body position, 30 percent propulsion. It doesn’t make sense to talk about putting a bigger engine into a barge. Turn that barge into a long, streamlined hull first, and then work on putting a bigger engine into it. In summary, for the majority of triathletes, swimming faster is akin to learning to play a musical instrument—a skill that’s learned and improved through focused technique instruction and practice, not by banging on the piano keys for hours and hours. Put down your training hat this winter, and focus on learning how to “play” your swim technique correctly.